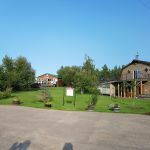 Ask fellow campers about "Rolling Green Fairways Golf Course & RV Park" and nearby attractions. Located just on the west side of Lloydminster, Alberta. Most sites are fairly open; although for our site #27, the trees at the front are overgrown to the point where it was safer to back out of the pull-through site to avoid scratching the sides of the trailer - somewhat negates the value of a pull-through site. It had rained for most of the week prior to our arrival, so maintenance staff were pumping water out of the low-lying grassed areas. Since the service pedestal is shared, our water and electrical lines had to cross under the trailer and into the area beside the trailer where we walked. Must have a sewer adapter. Wireless was impossible to access. Abundant grassed areas throughout the park. Service centre (includes a laundry facility) was somewhat dated. We camped at Rolling Green Fairways Golf Course & RV Park in a Fifth Wheel. There is a 18 hole golf course and restaurant as part of the business. Course was in pretty good shape given the excessive rain. We actually stayed in April. They had just opened the campground for the year. The bathrooms and laundry were not open yet. We did have P/S/W. Site was level and long. And fairly wide. They all were pull thru and easy in and out. It is right on the golf course. But we didn't get any golf balls by our trailer. Everyone working there was friendly. WiFi wasn't working. There is a play ground. And they are on the end of the road making it okay for dog walking. Dumpster for trash. We would stay again. We camped at Rolling Green Fairways Golf Course & RV Park in a Travel Trailer. Signage to campground from Highway 16 good. However once on property signage to campground limited. No formal place to register, lady in golf cart greets you. Campground was full with seasonal workers but taken to overflow camping area which had water and electricity (30amp) and overlooked the golf fairways. Electricity solid but water pressure was poor. 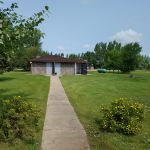 Negligible infrastructure to campground but quiet with open aspect and convenient to Lloydminster. 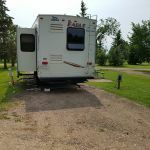 We camped at Rolling Green Fairways Golf Course & RV Park in a Motorhome. 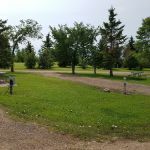 Are you affiliated with Rolling Green Fairways Golf Course & RV Park ?